We’ve long been fans of Improv Everywhere’s Best Buy flash mob, but never had a good chance to do our own version. Clearly Best Buy had no sense of humor about the topic, and we figured most companies like them would be about the same. After Steve Jobs passed away, this idea seemed like a great way to pay a little tribute to someone who had an enormous impact on our lives, and maybe have some fun in the process. We contacted a Phoenix t-shirt shop and had them create special custom shirts for us – royal blue with a heart shaped logo on the front. Oh, and the heart had a piece missing out of it. And a leaf. Look familiar? 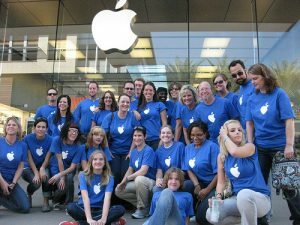 This past Saturday about 25 Improv AZ cohorts donned those shirts in a flash mob at the Apple Store in the Scottsdale Quarter. 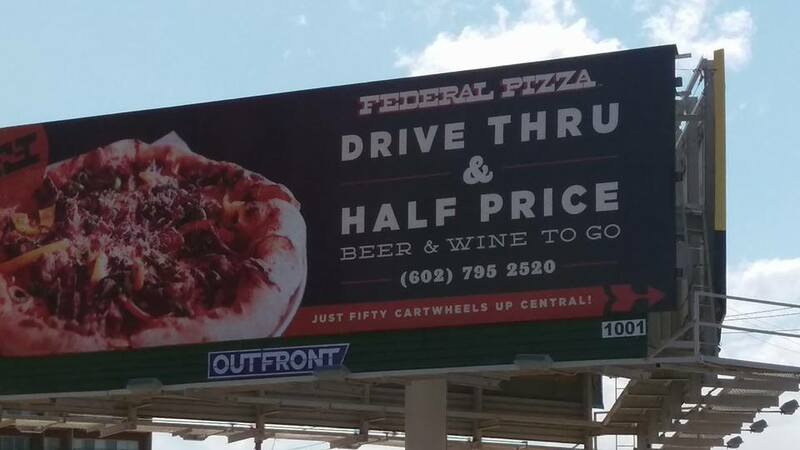 The plan wasn’t to disrupt their business in any way, but just to have fun and make people laugh. 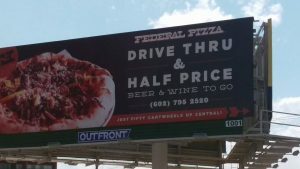 We figured with 25 of us we would outnumber the employees, and maybe even the customers. As we trickled into the store, the surprise was on us – the place was packed! We had never seen an Apple Store that busy, maybe because of the new iPhone launch, and the employees noticed us right away. They started chatting away into their earpieces, and a few security people started paying us extra attention. We just browsed and wandered around, so the employees must have decided we were mostly harmless. They kept an eye on us but didn’t ask us to leave. So we had fun! We put pictures of ourselves on many of the computer’s PhotoBooth screens, but employees came right behind us and removed them. 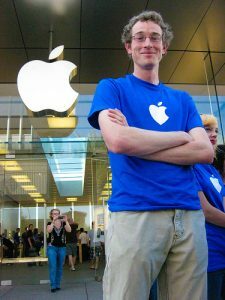 Most of us were very familiar with Apple products but referred customers to real employees whenever asked. However, one lady refused to be sent away. She was quite happy with the help she received and admonished an Apple employee that the prankster should not get in trouble for being such a nice young man! We shopped for merchandise, made our phones all Quack, and chatted with everyone we could. Some customers were confused, and one remarked “Wow, Apple sure does have a lot of employees!” but most laughed when they realized what was going on. Most employees took it in good fun once they realized we weren’t there to cause trouble. We heard “flash mobs” being used as an example in a Genius Bar training session, and a few employees asked where they could get a shirt like ours. We had two photographers help capture the flash mob, and both helped shoot our shenanigans before. This one was trickier because we were trying to be covert so they couldn’t use their normal camera gear. They each wrote blogs about the experience and trying to take good pictures with a small camera, so if you plan to try something like this yourself see what the very talented Sheila Dee and Devon Christopher Adams had to say. Check out all of their pictures (and a few others) from the flash mob in the Apple Store Flash Mob series on Flickr. We’ve had a lot of requests for other people who wanted a shirt, so you can order an Apple Heart Shirt from Brand X. We don’t make any money off these – they’re just a fun thing to wear so we wanted to pass it along. Want to be a part of a future flash mob with us? Join our email list! We don’t always announce them on our blog and Facebook, so our email list is the best way to stay connected. Recap of Fake Protest Part Deux – Down With Sequels! About 30 people came out for Improv AZ’s Fake Protest #2 – Down With Sequels! 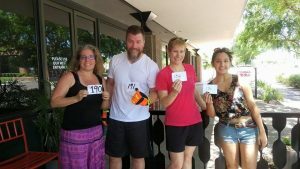 We gathered at the intersection of 20th Street and Camelback Road in Phoenix and lined the street where cars waiting for the light to change could see us. Everyone made their own signs that protested nothing. The responses are the most entertaining part of these things, and we had every kind you could imagine. Some people tried to ignore us. Many people smiled and honked their horns, while other people tried hard to ignore us. A fire truck stopped at the light held asked what we were protesting, then gave us a monstrous honk when they found it was for fun. A few passersby who struggled to wrap their brains around the fact that dozens of people would spend their Saturday morning standing on a street corner with funny signs. Nearby mall security and the Phoenix Police made a few passes and checked us out, but let us carry on. One of the best reactions came as we were wrapping things up and taking our final group picture. A woman came up and thanked us because she was having a really bad day until our display of absurdity made her smile. She turned her car around and stopped just to let us know. Perfect! 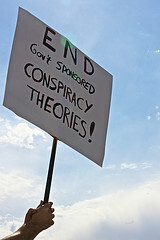 Lots of photos of the fake protest are on Flickr, thanks to talented Phoenix photographer, Sheila Dee. If you have your own pictures on Flickr, use the tags “improvaz” and “fake protest” so they show up in our search. You can also tag yourself in our Fake Protest Facebook photo album. Thanks to everyone who came out – another flash mob should be announced soon!